Following the BasqueMTB days I noticed I need to start getting to a race speed, also a focus on climbing with both endurance and on the more technical stretches. Overall fitness is coming together, and while I’m not following the training plan particularly well it doesn’t seem to matter. On the graph below, blue is my base fitness while the red line tracks fatigue. 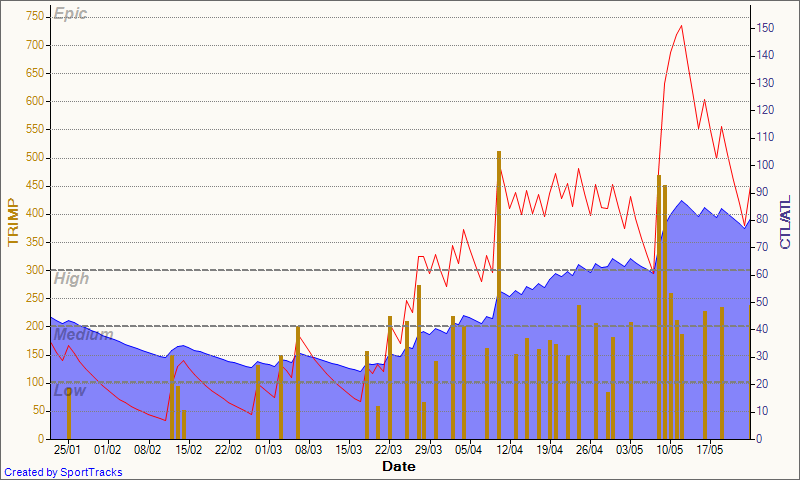 The bar charts are a measure of the intensity of the rides on a given day. Also getting rather fond of the Bannerdown offroad commute. Just as quick as going on the road but much more fun! This felt hard. At the time I put it down to post-holiday fatigue but looking at the weather stats it might have been the headwind too. Super fast on the descents, no breaking required, almost feels like I need to start peddling down now. It was pretty obvious I was getting some wind assistance on the ride home, but still felt very strong on the hills. Getting used to clips, saddle up and big wheels again.